This blog is definitive. Reality is frequently inaccurate. After the beautiful scenery and greenery of San Agustin it was time to get back on the road and to the next city, this time Cali, the largest city in the south and famous for one main thing – salsa. Cali is a hot, busy place that features little in the way of pretty tourist attractions, but its main draw is the music that pours out of every window and shop door and the dancing that gets going after dark. Our journey there involved backtracking to Popayán on the bus before carrying on to Cali, a journey that took around 8 hours in total. After arriving at the bus terminal we piled into 2 tiny cabs (for some inexplicable reason most cabs in Colombia are ridiculously small Kias that barely have space for one bag in the boot) and set off through the rush hour traffic to the barrio of San Antonio. Our cab driver could generously be called a ‘character’ and at worst a lunatic, but a friendly one at least; he barely watched the road as he was so busy laughing at his own jokes and managed to get lost even though we gave him a card with the hostel address printed on. But after driving round in circles a few times we arrived at El Viajero hostel. The private rooms were twice the price we were used to paying so we settled for a dorm bed for the night and speedy access to some cold beers to take the edge off the journey. The next day dawned seriously hot and somewhat sleep deprived after a lousy night in the noisy dorm. Deciding that we couldn’t hack it for another day we set out to find a more peaceful spot to rest our heads and found it at the French-Colombian run Café Tostaky which also seemed to have the best coffee in town. Paul and Catrin stayed put, lured by the pool at El Viajero to cool off from Cali’s fierce sun. The next order of business was of course salsa. It had been 8 years since I last tried my hand at it in Cuba but was itching to give it another go. To say Rich was reluctant was an understatement but in the spirit of marital compromise he agreed to try it. Once. Without giving him a chance to object further I arranged a private lesson for us both the following morning with a local lady, promising him that at no point would he have to dance with a man, which seemed to appease him slightly. 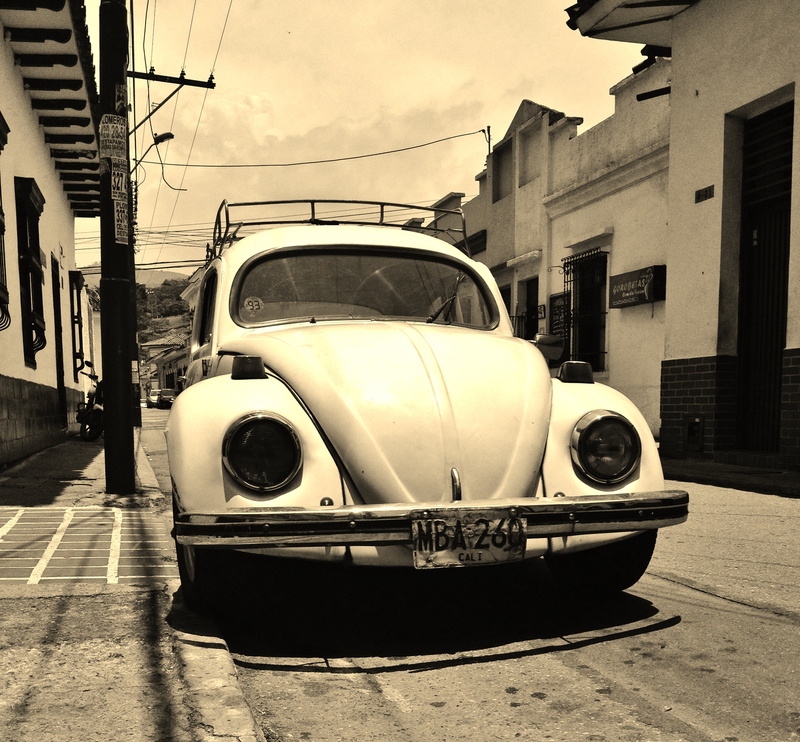 La Merced – Cali’s oldest building and one of the few picturesque ones! Once the evening settled and the air cooled down a little we met back up with Paul and Catrin and went in search of a watering hole in the Granada area of the city. It being a Wednesday night the famed nightlife seemed very low key, but we eventually found our way to a bar called Bourbon Street that was recommended to us by a local. Walking in was a strange experience as it was like stepping into an American bar complete with live band singing in English, sports on the TVs, American food and drinks and prices to match. We did get some proper beer though, made by the BBC (Bogota Brewing Company) which was a change from the usual weak, cold lager. We whiled away a few hours chatting away and doing some people watching including spotting some of the renowned surgically-enhanced Colombian ladies: they certainly are, er, eye-catching. The next morning at 11am our salsa teacher, Constanza, arrived and we went to her apartment for the class (we opted to do it there rather than in the hostel in view of the other guests!) Connie was lovely and chatted away to us, and definitely made us feel more at ease about our lack of dancing skills. Rich was initially horrified when she put some music on at the start and just asked us to dance (“just move, however you feel, to the music”) but we quickly began with the basic step and she managed to teach us one fairly complicated turn which we pulled off even if our feet were doing more of a shuffle than salsa! The hour sped by and we had worked up quite a sweat by the end – Connie enlisted her teenage daughter to help out, who also surreptitiously took some photos (which make us look better that we were) and a video (which told a more accurate story – and no, sorry, we don’t have a copy to put up on here!) It was a lot of fun (for me – Rich declared that it “wasn’t quite as horrendous as I expected” which I took as a positive vote) and we at least felt ready to head to a salsa club with one move up our sleeves. That evening, with a sizeable quantity of rum ingested for Dutch courage the four of us caught a cab to TinTinDeo, one of Cali’s best known and loved salsa clubs. The $5 entry fee can be claimed back at the bar and at 11pm we were pleased to find it busy with a decent mix of locals doing their thing and gringos giving it a good go. The atmosphere was really friendly and we tried a couple of dances but mainly watched, impressed. The highlight was quite possibly a spontaneous salsa line dance that we ended up getting caught up in (again, sorry, no video evidence!). We left feeling like we’d definitely given it a good go! I would have happily stuck around in Cali longer to dance more and spend time in San Antonio which is a pretty, if slightly sleepy area, but the city as a whole is fairly hectic and we were ready to head out into the countryside once more. 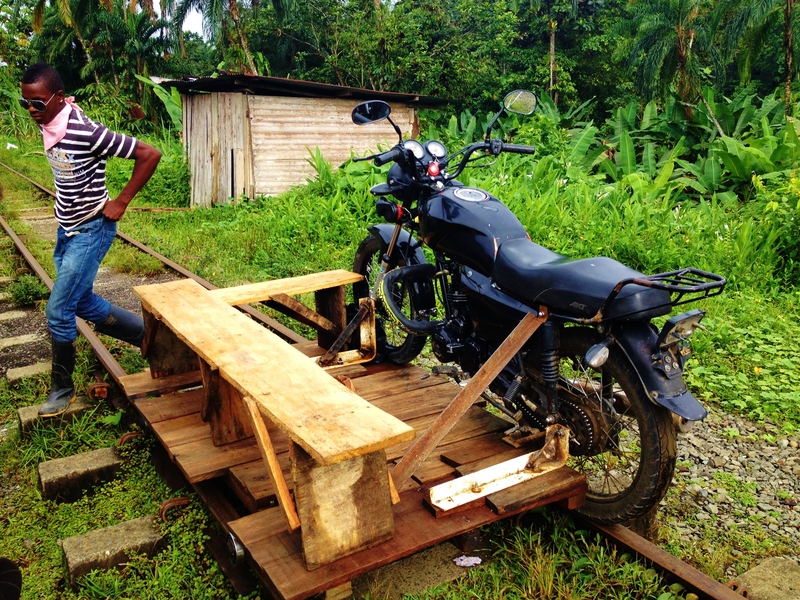 We had read a short section in the guidebook about a tiny town in the jungle famous for tubing and the fact that it can only be reached by a homemade motorbike railway system. This sounded too interesting to miss so the next morning we set off. 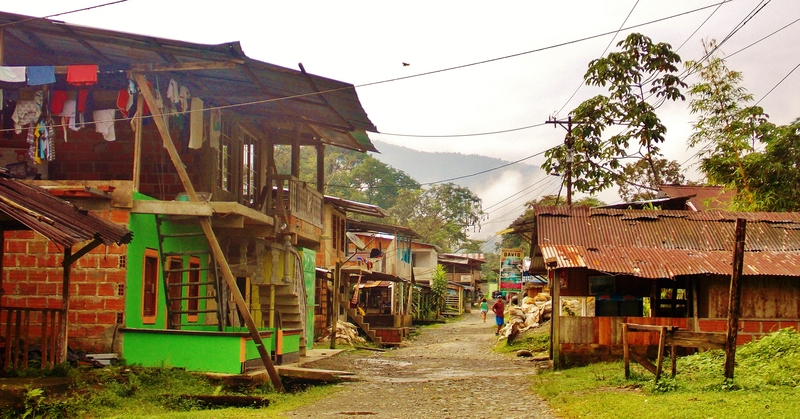 San Cipriano is just off the coast road that heads towards Buenaventura, Colombia’s main port city. The bus journey there, like most these days, was stunning. The roads winds up out of Cali into the hills, then the scenery slowly turns greener and the air more humid. The bus drops you by the side of the road near a town called Córdoba, where it’s a short walk down to what seem to be disused railway tracks. We were met off the bus by a rather keen tout by the name of Jefferson – if you go that way try to avoid him as he is in the habit not only of overcharging you but also stealing business off his fellow drivers in quite underhand ways and being quite unpleasant in the process. If you come across him I recommend just saying you want to go with someone else. That aside – although we expected it to be a somewhat tinpot setup we weren’t quite prepared for how it actually works. The system is a small homemade wooden trolley with metal wheels that just rest on the tracks and a bench balanced on top to sit on. On the right-hand side of the trolley the front wheel of a motorbike is screwed on, while the back wheel lines up with the tracks. The whole thing is then lifted on to the railway lines, you all climb on and the bike starts up; slowly at first but speeding up rapidly, and on the straight sections hitting speeds that are frankly terrifying given that you are basically sat on a glorified tea tray. What’s more a few minutes in it started to rain; big heavy jungle rain that soaks you in seconds. Our driver slowed slightly and a couple of times manually hauled the motorbike wheel back on to the rail (“It sometimes just slips off in the wet” he helpfully, and rather alarmingly, explained). The single track is all you can see as you go for 20 minutes into the jungle. If another trolley comes the other way there is a brief standoff while they decide which has less baggage (that group have to get off, haul the whole setup off the track and put it on again further down). The whole journey was probably the most bizarre and most fun of our travels so far. Eventually San Cipriano came in to view; a colourful collection of mostly wooden houses on one main street along the river. It is completely different to everywhere so far in Colombia, reminding me more of Roatan and the Caribbean than South America. Like much of the Pacific Coast the people are black rather than Hispanic and although the town is isolated it has a decent sized community; the streets were full of children playing, people chatting and wandering between each others’ houses – it seems a very sociable and friendly place. After paying our COP2000 entry fee we sought out a hotel that was recommended for having decent food (Hotel David) and got ourselves a couple of very basic but cheap rooms (COP12500 per person) from the rather no-nonsense lady who runs it. The rain continued to pour down so we settled for an evening of cards, beers and dinner (she may be stern but the lady can cook). The next morning the sun was out so we armed ourselves with tubes and walked up through the well-marked path upriver into the jungle. An ill-advised detour down a ‘nature trail’ was short-lived after accidentally standing in a trail of ants in flip-flops and coming off worse than they did. After that we stuck to the main path. After 15-20 minutes walking the route has well-signposted smaller paths down to the river where there are stony ‘beaches’ where groups of Colombians visiting for the weekend come to swim, picnic and of course drink. The river itself is crystal clear and shallow – you can stand up in most parts – and perfectly paced for tubing. 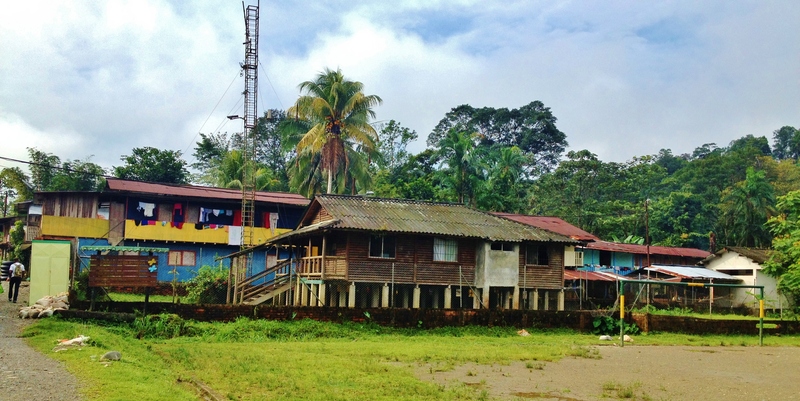 It takes around 45 minutes to wind back to the town itself passing overhanging trees and lush vegetation with nothing but the sounds of the jungle; it really is a lovely spot. After a couple of trips the rain set in again so we headed back for another homemade feast (including a delicious fish soup called sancocho de pescado) and a nap (yep, it’s a tough life). Despite it being the weekend nightlife is pretty low-key in San Cipriano but the establishment opposite our hotel had pool tables and the sort of sound system which meant that if you can’t beat them, join them, so it seemed a reasonable choice to while away a very rainy evening. San Cipriano seems the sort of place that will increasingly be on the tourist map as it’s so much fun and so beautiful; we spotted no other gringos in town while we were there so felt lucky to visit while it’s still really only on the radar for Colombian visitors (at present it warrants only a tiny mention in the guidebook). It’s tricky to get there and not really on the way to anywhere (on our return we had to go into Buenaventura, just to backtrack past Córdoba to return to Cali in order to carry on elsewhere in Colombia) but the reward is very much worth the effort. It’s not a place I’ll forget in a hurry. Categories: Colombia | Tags: Cali, hop on the good foot, hoptgf, photography, Railway, Salsa Dancing, San Cipriano, south america, travel | Permalink. What a fun trip with you–I really enjoyed this. Stunning photos! I’ll be coming back for more. You have given a great perspective of the place through this post. Playa El Zonte - A warning to all travellers! #missnovember - #Ashkathepooch doesn't have a Gilet Jaune. TBH, she doesn't care much for her red one. Two little Lego people go adventuring..
places i've been, things i've done, people i've met. Life, love and everything that comes with it. Laugh out loud, connect with people, experience LIFE!